The world isn’t a fair place, and yet another way this is laid bare is the huge differences shown in Internet penetration among the population of the various world regions. We thought it would be interesting to see what kind of an effect this is having on the world Internet population of today. Today’s world Internet penetration is 24.7%. North America, with only 5% of the world’s population, has 15% of the world Internet population thanks to having the world’s largest Internet penetration with 73.9% (largest for a world region, but there are individual countries with a higher percentage). 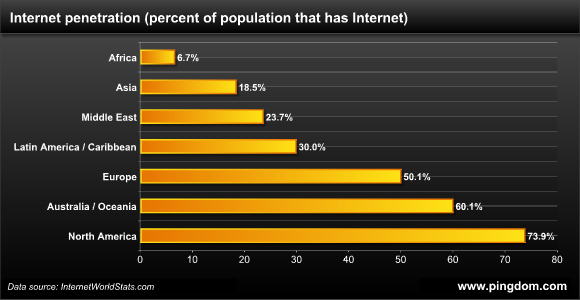 If Asia had the same Internet penetration as North America, it would have 2.81 billion Internet users. That’s 1.7 times the current Internet population of the entire world (1.67 billion). If the entire world had the same Internet penetration as North America, the world Internet population would be 5 billion people. There are lots of interesting “what if” scenarios like the above, but we don’t want to get too carried away or we’ll never get to the main part of this post, which is to look at how the differences in Internet penetration have affected the division of the Internet population as a whole. What happens when you compare how the actual world population is divided with how the world’s Internet users are divided? 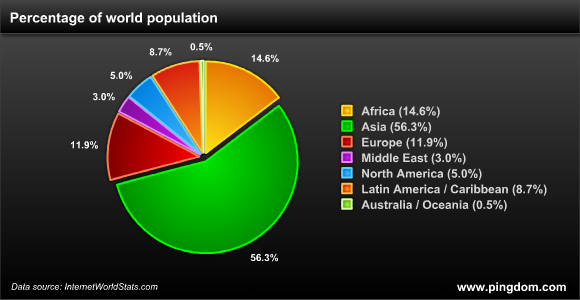 First off, here below is a pie chart that shows the share each world region has of the planet’s 6.77 billion people. This is also what the division of the Internet population would look like if the Internet penetration were equal all over the world, but of course it isn’t. 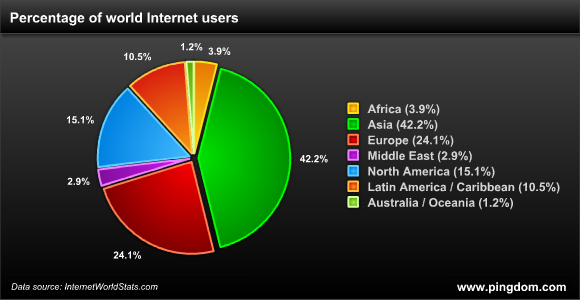 Now let’s look at the ACTUAL division of the world Internet population. Look at how Africa dwindles, look at how Asia shrinks. Giants in terms of population, but the weight of those populations are greatly diminished online. In contrast, regions like Europe and North America swell past the actual weight of their populations. You could say the Internet is a different world, one where the population truly reflects the different levels of industrialization in the world. We could throw more statistics your way, but we’ll call it a day this time. It’s when we see this kind of data that we really count ourselves lucky to live in Sweden, which has an Internet penetration of 80% and decent broadband connections for more or less anyone who wants it. Data source: Internet World Stats. (Check it out, lots of interesting data that you can crunch and play around with like we did in this article). Truth? Maybe. Sad? Maybe not. Why would internet use be the same in every country? Use of internet technologies varies wildly from city to city, let alone from continent to continent. The great advantage of the internet is precisely that it encourages strongly bonded social groups to form and doesn’t treat them as all having the same needs or aspirations. Be careful that you’re not judging what everyone else “should” want based on what “we” want. @Daniel: Of course there are more pressing concerns, but this article was about the state of Internet access. Great that more bandwidth is coming to Africa, though. @Dave: The Internet is another resource, another tool, and if you don’t have it, you’re at a disadvantage. Especially if you look at it from the perspective of a global economy. In New Zealand we have a reasonably good internet uptake, but there are challenges. The country is about the same size as the state of Colorado, with only 4 million people. We are at the end of a long undersea fiber-optic cable which carries all our traffic. This carries a cost… with the accompanying problem of monthly traffic caps. ISPs here are turning this to their advantage though. They don’t differentiate between international and in-country traffic. Plus they’ve installed huge caching proxies everywhere, so you get charged for using the cable even if you’re not! Please update this page population percentage. now it should be changed.